FORBIDDEN PLANET—–“Id, id, id, id , id !” If not the King of 50s sci-fi epics, than certainly in the Top 5, this by-turns intelligent and dopey, always visually exciting extravaganza is an enduring favorite for fans of outer space adventure from the Ike Age. Borrowing from Shakespeare’s “The Tempest” no less, the MGM dazzler plops you onto the multi-hued surface of planetoid Altaire-4, in the year 2200. 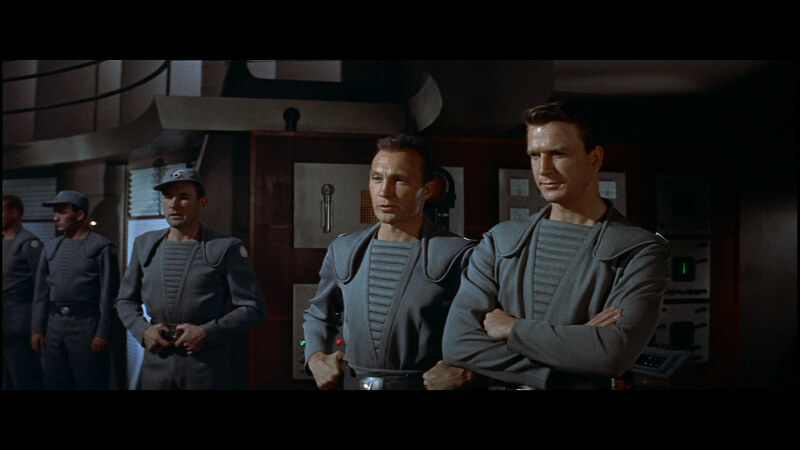 A group of Brylcreem’d astronauts are investigating the mission that preceded them by a few decades. What they find is a ‘Dr. Morbius’, played by Walter Pidgeon, in the role he will likely be best remembered for (people who knew him from Mrs.Miniver having mostly gone on to the great Id-bin in the stars). Brilliant, none-too-hospitable, Morbius is alone but for his leggy daughter (Anne Francis)—full of facts but bereft of sensual wisdom (here come our guys! )—and ‘Robby the Robot’, Numero Uno among the metallic clankers we’ve come to know and love. Is that an anti-matter belt in your pants, or….? There is also an invisible monster from the recesses of one’s own private terrors, a beast of the subconscious Id that rampages around at night, defying weaponry, stamping big footprints in the Altaire dust, tearing screaming victims of the supporting cast to so much atomized debris. Disney technicians partnered with the art directors and sound men from MGM, coming up with visions of the Id-things demonic fury and an array of eerie sound effects that stand the time-test quite ably. A one-of-a-kind electronic music score was whipped up from Louis & Bebe Barron. Costumes were space-agey, the script is fun. Art direction and sets of the mighty ‘Krell Empire’ are still astounding if you just open/close your eyes enough to have a little retro fun. What more do you need with exclamations like the following: “The fool! The meddling idiot! Did he really think his apes brain could contain the secrets of the Krell?” Indeed, as we are advised that the machine that runs Morbius’ complex measures 20 miles on each side and is powered by 9200 thermonuclear reactors. Well, at least his daughter and Robby are there to help change the occasional rod. Why, yes, cleaning the ducts is time consuming. This way now, gentlemen…..
Fred M. Wilcox directed the 1956 venture, which brought in around $2,800,000 (multiply time), but it entered a loss due to the cost of $1,968,000–a loaf for this type of film back when. Running a quick 98 minutes, nominated at Oscar-time for Special Effects, it’s now safely considered a classic. The young turks sent to deal with Morbius, his kid and their ids include Leslie Nielsen, Warren Stevens, Jack Kelly, Earl Holliman, Richard Anderson and James Drury. The Barrons duo were pioneers of electronica music for avant-garde patrons of the Greenwich village beatnik scene where they lived and were ‘discovered’ for employment on this project.